The Love Train needs a sassy new chick to lead it to Funkytown, but it's going to take a real dancing queen to keep up that kind of energy. 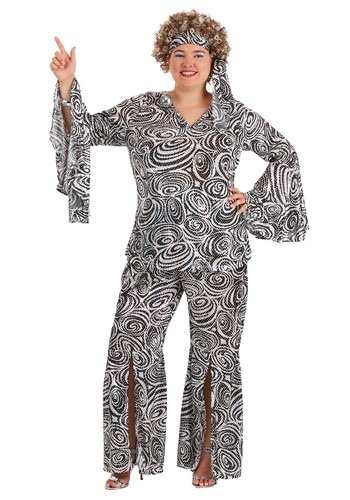 Sporting the right threads definitely helps, too, and this Plus Size Foxy Lady Disco Costume will put some pep in your step while you're shakin' your groove thing! Is there anything more exhilarating than hearing your favorite disco tune fill the room? Whether you're kickin' it at a funky dance club, or blasting the 8-track player in your car, you just can't help but move to the beat. And while there may be pressure to show off your best dance moves, the most important thing to remember is to just have fun, because that's what disco is all about. It's about gettin' up with the get-down, doing the hustle, and boogieing til you just can't boogie no more! And the best part is that even if your dance technique is a little rusty, nobody in the discotheque is gonna notice through all the sparkling lights and fog. So, dance on! All of the other dancers will also be so blown away by how wicked your costume looks, your moves are going to look fantastic, no matter what! The matching blouse and pants are covered with far-out printed swirl patterns and flashy sequins, and flare out on the sleeves and legs, to get everyone in the dancing mood. Style your hair into a fierce 70's do, or grab a funky retro wig, and tie the matching hair scarf around it, and you'll be the foxiest lady under the disco ball!